Many of us easily recognize areas in our lives that need to be cut away. We stay in unhealthy relationships. We continue in our bad habits. We exploit our time and money. We battle bouts of selfishness, anger, or we completely lack forgiveness. Hands down. These are branches that need to be removed! Sometimes, however, there are branches we think are healthy and good, but for God’s glory they too need clipping. For God to do even greater things in specific areas of our lives, there must still be some cutting. But we are a stubborn people. We are happy with the status quo of our branches. We think they are pretty enough. We stop short of prolific and becoming profoundly fruitful. 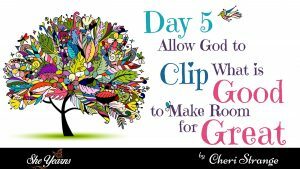 It’s time to let God clip what is good to make room for great. It may be a job, a ministry, an opportunity, a relationship, an area of service or giving, the location you call home, or even the house where you worship. It could be where your kids attend school, your college, or anything that would take up time or space or resources in your life that could give Glory to God and be fruit-bearing. For me, this is a difficult step in the process. These are not dead branches. They are vibrant, flowering and fruit-bearing branches. It often doesn’t make sense to my human understanding why these must be cut back, sometimes severely. How do we recognize when God might be prompting us that it’s clipping time of this nature? Graciously, the Holy Spirit nudges our stubborn hearts. Other times, He uses circumstances, people, even our health, and most assuredly, His Word. This is the kind of year I am having. I have streamlined my life to the bare bones as it is. The only things to cut were places I felt necessary. Places of calling. Important work. Dear people. Stuff I loved and ministries that excelled. Allowing God to cut what looks perfectly fine hurts because with it comes a sense of purposeless loss. And how can we be sure it will be worth it? That’s the heart of our hesitation, isn’t it? Can we trust Him? Maybe that’s why He gives us this word picture of The Vine. We know a severe pruning makes all the difference to a healthy branch. We’ve seen the effects. The call here is to trust His ability to know us well enough to make each branch more vibrant, more effective, and more fruitful—even when we can’t see it. Not only that, but the promise is to make this fruitfulness lasting. Will you trust Him today to increase your bloom ability? Rarely does the Lord criticize us for being too aggressive in matters of faith. When do we find Him suggesting that our dreams, our requests, our deepest needs, our greatest desires, are out of His league? When does Scripture find God telling His people to stop trusting Him for so much? Where does He declare Himself Unable? Instead, we find God asking His people how long they are going to keep meandering in the desert and put off taking possession of what He has already given them. No. It’s usually us. We put on the breaks. We stop short. For a hundred different reasons. Don’t let it happen today. Today Jesus offers something critical to the life of every believer. In teaching us how to take possession of what we have been given to become abundantly fruitful, He calls us to live in Him. What exactly does this look like? Picture two chairs pulled closely together so that two people could sit on the porch regularly and have good conversation and coffee together. It’s your go-to spot with your go-to person. He sits in one chair and you sit in the other. Before He moves any further –Jesus makes clear in the relationship, just Who is driving the relationship, giving the sustenance, and is responsible for the fruit-bearing. And it’s not you. Nor is it me. Jesus succinctly declares, He is The Vine. You and I are simply the branches. Why is this important? Because the only thing standing between yourself and a life of abundant fruitfulness is, well…you. Independence is your greatest foe, period. Learning to live in Him is absolutely key for increasing your bloom ability. Almost as if He knows our tendency toward waywardness and taking our coffee on the run, He makes an almost-too-good-to-be-true offer (John 15:7). Once we rented a duplex where there was the promise of a $500 deposit return if you completed everything on the cleaning list before you moved out. I wanted my promised $500. I was doing fine until the tasks became ridiculous. It wasn’t long before I realized the expectations were preposterous. The list was so difficult there was no way anyone could complete it and get the deposit back. It was rigged. When Jesus proposes that we can “ask whatever you wish and it will be done for you.” Is He serious, or is this rigged? Does He simply know we can’t keep our end of abiding, so He doesn’t have to worry about the providing? No. Jesus is not like my landlord. Sit in the chair, sweet girl. Ask Him anything. Tell Him everything. 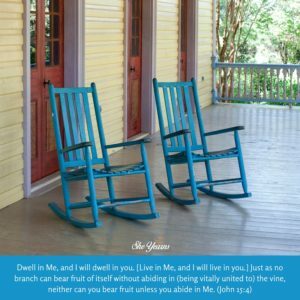 Just sit in the chair and learn to live in Him. And you will bloom. Have you ever ordered something on-line expecting it to be one size only to be disheartened when it arrived? Or have you believed the marketers’ promises of special amazing features, only to get half of them functional? Has there been a time when you purchased something that looked really good from the outside, only to be disappointed with the results? Left unto ourselves, that’s what can happen to us spiritually. You and I may produce plenty of leaves. We might look like flourishing plants! But there may not much fruit on our branches. 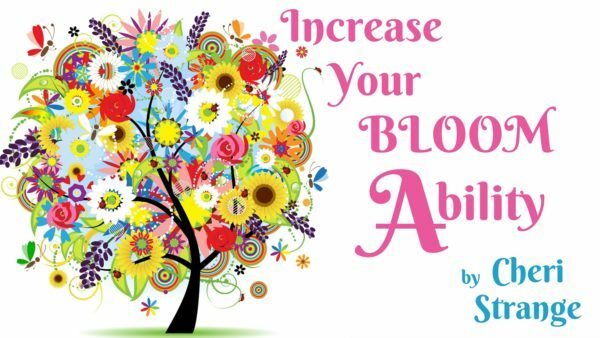 What might be keeping you and me from our blooming potential? Jesus addresses another key component for developing a fruit-bearing life in John 15. Maybe you and I are in need of a good cleanse. Extra leaves and stems use up the nutrients and resources needed for fruit-bearing. One way the Vinedresser cleanses the branches, is to pull off the life-sucking extras in the spring that drain the nutrients from producing fruit. Note, this is His regular activity. 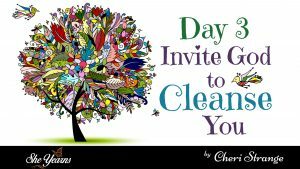 You and I repeatedly find ourselves in need of a good spring cleaning. Although we have nothing to do with it, I find it helpful to acknowledge this reality by inviting God to do His work in me. What uses of my time are more centered on what the world values – than what God values? What seems to spike up onto the calendar appearing urgent and overcoming the important? To what establishments is my money spent? Are they God-honoring – or do I spend it just like everyone else? Do my possessions look like the pile at my neighbors, who is NOT aiming to bloom for Christ, or is there a distinct contrast between us? 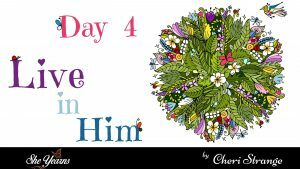 Are my actions God-honoring to those around me? Or am I stuck in the same emotional rut I found myself one, two or five years ago? The key here is this: It’s not enough just to look good. Looking like a fruitful branch is not the same as being one. We need the supernatural work of the Vinedresser for that. May we be receptive and open to receive whatever cleaning the Father sees fit to do in our lives so that we will become more and more fruitful from the inside out.